Yesterday March 9th, the team that works on #SQLDev, dropped EA2 out there for us to play with. For some random reason, I decided to check out SSH tunneling feature. If you are familiar with it in the EA1 release, some things have moved around and features have been added. Let’s take a look at these side by side. As we can see here, EA2 is building a tree of your connections. This change allows you to retain the SSH connection information. In EA1, you have to enter all the SSH connection information per connection. Once you configure the Host in EA2, you can set up the Local and/or Remote Port Forwarding credentials. In the previous release, the remaining step is enter the database connection information, test the connection (optional), and save it. Notice here unique to EA2, the port is assigned here in the SSH setup. This allows us to easily define several connections with multiple ports..
After creating the local port forward, it now becomes a dropdown option on the the EA2 Database Connection screen. Simply choose SSH as the Connection Type, and enter your other database connection credentials. SQL Developer 4.1 EA2 allows you to test and/or establish the SSH connection either on the SSH connection screen or here as part of the Database connection test. Upon success testing, save your connection and there you go. 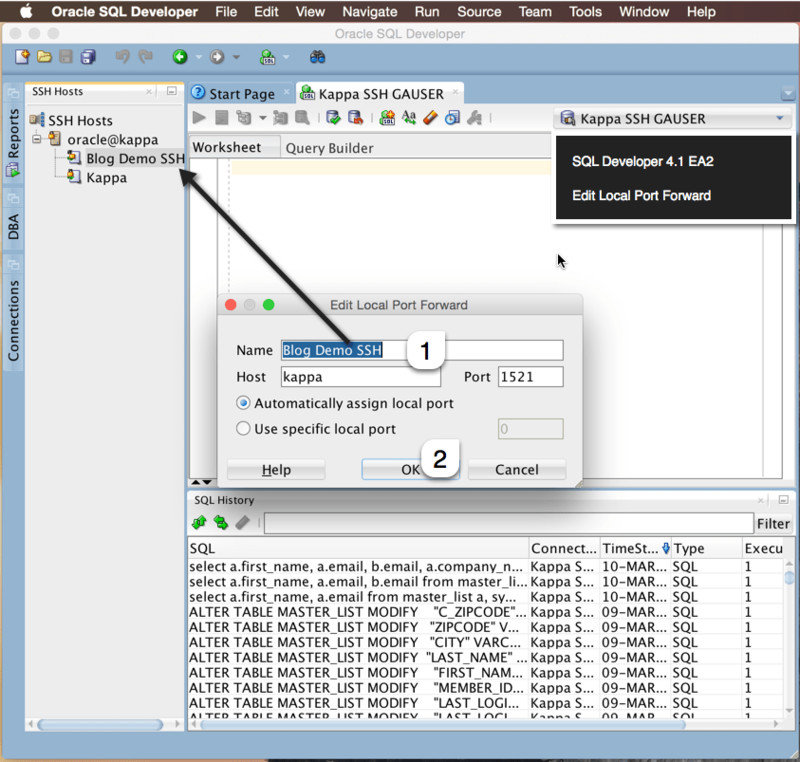 So go download SQL Developer EA2 and try it out. Please remember that this is a Early Adopters release. Please experiment responsibly in a testing environment.